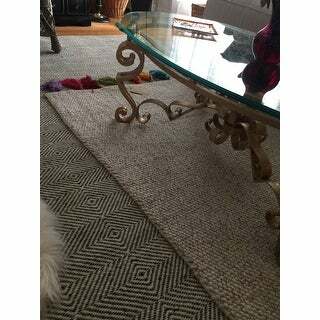 Love love love this nuLOOM Handmade Concentric Diamond Trellis Wool/Cotton Area Rug! It has great texture. Very good quality too. It’s nice a thick. I would recommend it! Add a simple, yet decorative piece to your home with this attractive wool and cotton rug. This rug is handmade and is perfect for any entryway, living room, or bedroom. The trellis pattern adds texture and style while also remaining soft and exquisite. The 0. 50-inch flatweave pile cushions will give your feet plenty of support and comfort. 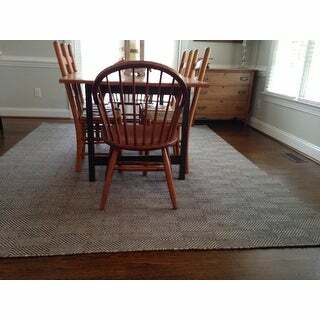 Option: Ivory - 7' 6" x 9' 6"
Wool without other materials that cheapen the rug (viscose, jute, etc), no latex backing, neutral coloring without a distracting/busy pattern/print that coordinates with another rug visible from our living room, low pile so the chairs in our casual dining area will easily slide across it, and a decent price...these are the qualities I have spent months in search of for our dining area rug; and this rug meets them very well. I cannot speak for the shedding as I just received it; but I have found wool rugs to produce minimal shedding. There is a slight odor that is not overpowering and based on other experience with wool rugs, I expect it to dissipate over time. *Note: the coloring is most accurately represented by the individual photo (at least, for the ivory colored rug). The photo of all three color options together shows a lighter ivory color, and I hesitated to order because of this. The individual photo shows a more "oatmeal" coloring, and that is a more true representation (in my opinion). There is an underlying black/charcoal background to the ivory color, so it has a less bright/pure ivory color. Shopping online for rugs is tricky...there is greater selection and better pricing, but it comes at the risk of not having that touch and see that you have with an in-store purchase. 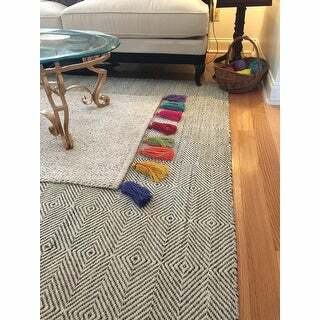 I spent months and did many, many online searches of photos of each rug I considered so I could analyze color, print, pile, etc. and feel somewhat "safe" about what I was ordering. This rug accurately meets my expectations for what I believed I was ordering. I was searching for many months....many many months for a fairly neutral diamond patterned area rug for my dining room. This rug was an excellent find for the price. I have dogs and was concerned that their claws would get caught in the wool weave however that has not happened. I have had this rug for almost a year now and it is still in the same condition I got it. It doesn't really shed but I do vacuum it once a week because of the area it is in. Our dining room is medium to high traffic and the rug is still great. The picture on overstock accurately depicts the actual rug. I wouldn't recommend this for a play room with children as this is not a soft rug but for something that is durable yet not too bad on the feet, then this is it. I bought the 7'6x9'6 nuLOOM Handmade Concentric Diamond Trellis Wool/ Cotton Rug in Ivory to use in a bedroom. It is better looking than described. Love that it is wool, and that the rug is thin, soft, and has no bad/chemical odor. The color of the ivory rug appears to be an exact match to the photos in the ad. Option: Grey - 7' 6" x 9' 6"
I love this rug! The design, weave, and colors are perfect - just as pictured. An earlier review complained about the shedding...of course it sheds; it's wool. I'd rather deal with the shedding and have an "organic" rug than man-made poly. Besides, after a few weeks, the shedding will slow. This rug is definitely a great value for the price. I wanted natural fibers with no latex or glued backing as I am sensitive to chemical smells and wanted wool to insulate a cold floor. It is hard to find something that answers those criteria without breaking the bank, and I am thrilled with this purchase. The rug is very comfortable underfoot even though it is not the softest rug, so maybe less perfect for babies than adults. I had it a few days without any underpad and was initially worried it would move around too much and get stretched out by chairs, but now that I have a good rug pad underneath it doesn't move and chairs slide easily enough on it. It is great at brightening up the space (I have the Ivory version), and I enjoy my living room a lot more now that I have this. My landlord repaired the wall after installing new windows and dropped some plaster on the rug. I only discovered it the next day after it had dried but it came out easily with just a wet clean rag. For rug pads, I actually recommend going to a local carpet store and getting the recycled rubber with jute type. It is comfortable, will never compress, doesn't budge whatsoever and lasts decades. This type of underpad seems to be unavailable online, and is only marginally more expensive than the felt and rubber ones which are nowhere near as effective. It makes this relatively cheap rug feel like a much more expensive one. I love the way this rug looks. I bought it in gray to go under my bed, and as a result, I don't find the busy pattern to be a problem at all - I love it. Agreed on it being a bit scratchy. It's somewhere between wool and sisal in texture. But to walk on it's just fine, feels soft and comfortable in bare feet. I just now laid it down and I don't smell anything unusual, and the edges are laying perfectly flat. Based on other reviews, I did purchase a felt rug pad (Overstock Premium Felted Reversible Dual Surface Non-slip Rug Pad), so that gives it a nice cushy feeling. It was more gray and less white than I was expecting (the gray is the dominant yarn), but it works perfectly in my room. Very satisfied. I love my wool rug. The ivory color is perfect. No smells - rolled out nicely. I used a non-slip rug pad. Its always risky to order large/oversized items online, but this rug was a huge success. The color is accurate, the quality is great, its a really cool-vintage-RH looking rug. Love it! This rug is a terrific buy for the price. Looks way more expensive than it is. Color: The grey option is a cool grey, very slightly on the bluer side of the spectrum. Not green at all. Texture: It's warm underfoot with a slightly bumpy texture, but very soft to touch. It is not uncomfortable to walk on, but the bumpiness makes it less than cushy. It definitely needs a rug pad to stay put. Very slick on a hardwood floor. I would recommend getting a high quality felted one to give it a little more padding underfoot and maybe minimize the texture. Gripes: Rug does not measure 8x10 but rather 7'7.5" x 9'9" Also the pattern is not centered evenly, so one edge has three-quarters of the diamond pattern while the other edge has a full diamond. Probably no one but me would ever notice that. Finally, one short edge of rug flips up and will not lie flat even 48 hours after unrolling it. Hoping this will chill out eventually. Still, I can strongly recommend this rug for the discriminating bargain hunter! The rug material feels nice to the touch and it looks good, there are minor imperfections, but as it is a handmade product this is ok. I was afraid this pattern might be too intense in the 8 x 10 size, but it is not as busy as I expected. It almost reads like a textured carpet. We have it in a boy's nursery with black mid-century furniture and it works perfectly. Fair warning, the wool-smell did take about 2-3 weeks to burn off but it eventually went away and there is no after-smell now. Though not exactly soft, the rug is comfortable for bare feet and sitting. I ordered the Ivory. I purchased this after it had been out of stock for a while (and was sorely disappointed because I didn't know if they would get the 8x10 in again) in ivory. I love it. It's beautiful and patterned without being overwhelming. It's not soft and cushy so I was surprised to read that someone put it in their nursery but it works great for a living room. One note of caution - our cat seems to really like the texture and if we're not on top of it, his nails can leave pulls in the rug. No issues thus far with our dog's nails. Option: Grey - 2' 6" x 8' Runner | Grey - 7' 6" x 9' 6"
Love the rug. Blends well with other rug in adjacent room. Still has a slight smell,though, after a few weeks. Lays nicely, no rolled edges. Would like to purchase same rug in a runner size. Is one availabe? At first, it did make me a little dizzy when I looked at it. But Now I'm use to it and it doesnt bother me. I've had the rug a couple months now and I still love it. Beautiful rug that feels nice on my feet and looks a treat in my living area! A few inches shy of 5" x 7" I'd say, but works so nicely I don't want to return it! I put this rug under the dining table and it looks very classy. It matches the brown/gray neutral decor in the house really well and feel nice on the feet. Very happy with the thickness and feel of the rug. Just got it out of the bag so not sure if it will shed, but I'm very happy with how it looks in my bedroom. The edges are curling up slightly but I hope they will flatten with time. this rug is beautiful, comfortable to walk on, and looks exactly like the photos. Option: Black - 7' 6" x 9' 6"
Very nice rug - but slightly thin (see the photos for more detail). I ended up returning the rug as it was a little too large for my space. The rug is a great value for the price. looks fantastic, and has held up really well even with my 2 year old running and playing on it. I can't begin to tell you how much I love this rug. It is so soft underfoot and really adds an amazing geometric design to Myspace. I've had it for a while now so can definitely give it an honest review. I purchased this in a smaller size for my kitchen as well. My husband ended up spilling spaghetti sauce all over it and I actually put it in the washing machine and it came out amazingly. It did shrink some but that was no big deal considering the fact that I would have had to toss it normally. I highly recommend this rug to anyone wanting a big bold graphic at a really fair price. "Can I return the rug, in case the grey is to blueish - like the described in the review? Does it really have a baby blue hint? I need it to be grey." "Is this runner grey or tan? It looks tan in the photo with the customer review, but grey in the listing." It is grey. Of course some greys are towards the blue grey, and some towards the tan grey, but this definitely reads grey, not tan at all. 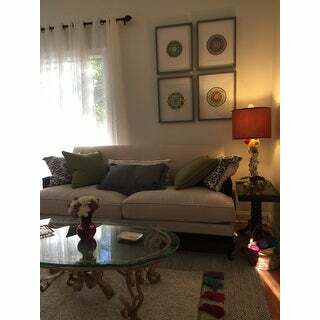 "The picture shows the black and ivory rug but the description says gray, which is it? Want to purchase the black and ivory rug! Thank you"
This rug is black and ivory. "Where is this rug made? " This area rug was made in India. "Will the larger black one be coming back in stock?" The nuLOOM Handmade Concentric Diamond Trellis Wool/Cotton 7’6’’ x 9’6’’ rug in black is currently out of stock. "Is it scratchy/itchy? Like for sitting in the floor and playing with kids? I’d plan to get a rug pad for some more plushness, but some wool rugs feel soft enough to to sit comfortably and some aren’t. " Yes it's too scratchy and way too thin for a play rug even with a rug pad.